If you believe that ones choice of audio cables matters -- and what audiophile doesnt? -- be of good faith. Our pilgrimage, beginning in the Slough of Despond, rises apace to Paradise. You never leave the house? How come? In short, Im no audio-cable encyclopedist. However, were the designer wires Ive had in several systems high-performance cars, Id be the sort of bon vivant society gossips gossip about. Entirely apart from my early investigations into lamp cord and no-name interconnects, the serious wire Ive had experience of includes Kimber, XLO, Transparent, Straight Wire, Harmonic Technology, Acoustic Zen, Silversmith, RS, and Nordost, generally several levels of each. I am not that hypothetical audio journalist with an A-to-Z grasp of the field. Hed be sitting in the sweet spot with an IV feed in his arm, the nutrient sack dangling from one of those rolling hospital stalks. Hed also need to replace the carpet semi-annually owing to the path hed have worn from sweet spot to system and from system to sweet spot, back and forth and back and forth. So no -- Im not familiar with everything out there. Heaven help the geek who is. Never mind how it sounds -- Audio Magics Clairvoyant 4D balanced interconnect ($2200 USD per meter pair) is an astonishment merely to behold. It measures 1.75" wide by 0.25" thick, and is heavier than several high-end speaker cables Ive had in my system. Its XLR terminations are odd -- their outer shells are missing. Jerry Ramsey, Audio Magics main man, tells me that the hardware is silver-plated Neutriks stripped to their skivvies. He says they sound better that way. He also accounts for the 4Ds unusual weight: three sandwiched, 1.5"-wide, 0.006"-thick silver-ribbon conductors. The 4Ds outer jacket accounts for the extra 0.25" of width. While Ive never had the pleasure of an IC this visually imposing, the real showstopper is the 4D speaker cable. Imagine four albino snakes caught napping lengthwise on a busy road: four 3"-wide ribbons snugly sheathed in white, two per side -- and costing $4500 per 8 pair. Remaining with the unconventional, the 4D speaker cables spade lug swivels, sort of. A short length of threaded wire protrudes where the ribbon ends, and its to this that the threaded lug attaches. (The end-user can replace the spades with similarly threaded banana plugs.) To remain with my initial assumption of a different purpose, the spade lug can be angled, if necessary, to accommodate the cable to a recalcitrant binding post. The Wilson Audio WATT/Puppy 7s posts are 0.75" apart on center, with 0.25" of free space between, and theyre recessed. Thats tight, but nothing compared with my Mark Levinson No.33H mono amps. Owing to the spade lugs angle, it collides with the binding posts plastic wing nut. Fuss, fume, and fret as I might, I couldnt install the Clairvoyants at the back of my amps. In response to an e-mail that went something like "Assign these crazy things to someone else!," Marc Mickelson responded with a there-there-remember-what-the-doctor-said-about-getting-all-worked-up note in which he explained how to get around the problem. All youve got to do is open the amps binding-post gap just enough to slip in the lug, then tighten. The lug will move along with the wing nut until the wing nut binds in place. The trick is to begin at a point that will bring you where you want to end up. What with those miserable wing nuts, an absurdly confined working space, the amps intrusive heatsinks, the angled spades, and the cables width, its not the kind of installation that has one humming a merry tune. That comes later, after another word of caution. I aced the installation at the amps, and, to my continued embarrassment, the procedure got easier as I removed and replaced the cables while making comparisons. I have not checked out Clairvoyants single-ended IC. Normally, balanced ICs lock in place at their male and female ends. Thats one of their attractions, particularly in professional applications, where the danger of yanking a cable loose is rather greater than at home -- unless youve got pets or kids cavorting at your sound systems backside. The balanced Clairvoyant ICs lock in position at the amp side but not at the CD player. I questioned Jerry Ramsey. He says Im the first to have this problem, and, in fairness, one cable of another firms pair of XLR-terminated ICs would not lock at the player side. Whatever, the Clairvoyant ICs are now snugly seated in the players outputs. If the customer wishes, Ramsey will build balanced Clairvoyants with fully clothed Neutriks -- at, he cautions, a slight sonic expense. Kidless, petless, and happy as a clam, Im staying with what I have. The received nitty-gritty: The Clairvoyant 4D interconnects and Clairvoyant 4D speaker cables ultra-pure, 0.006"-thick silver ribbons are cryogenically treated (theres a lot of that going around these days), as are the terminations and Waco Technical Company (WTC) silver-soldered joins. The hand-polished conductors are further treated with ProGold compound to stabilize noise. Then theres Audio Magics exclusive Molecular Stabilization Treatment (MST), performed by "a company connected to the space industry." 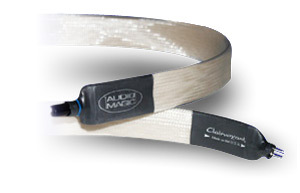 (MST is applied to all Audio Magic cables with the 4D designation.) Ramsey states, "A friend who works there has been kind enough to do these treatments to our products. According to the company president, MST is good for a lifetime." Speaking of lifetimes, "The cables take a minimum of 400 hours to break in and will continue to improve up to 1000 hours." For me, 400 hours -- never mind 1000 -- of break-in break down to a great many days of play. However, and happily, I could hear the fog dissipating after about 10 hours. After about a dozen, I found attractions outweighing whatever impedes these critters in their unripened state. At around 30 hours, I was curious to know how and where the cables could improve. But they did. "Heaven, Im in heaven . . . "
Long before the Clairvoyant 4Ds achieved their suggested maturation, I played a recording of Purcells opera Dido and Aeneas [CD, LOiseau-Lyre 436 992-2]. The recording features several offstage storm effects. Sitting there in the sweet spot catching up on some magazine reading, I was startled out of my self-improvement reverie by what sounded like a major collapse in another part of the house -- a wall at least. Not so. That ominous rumbling came from the speakers. In the matter or profundity, the Clairvoyants wanted not. In fact, that was the first nice thing I noticed about them: a soul-satisfying fullness from the midrange on down. Once upon a time, I drove a different audio system in a different room with first one, then two enormously powerful Crown Macro Reference power amps. For maximum low-end performance, the Crowns manual recommends cable conductors thick as broom handles. What I know of electrical engineering could fill a matchbook in 24-point type with room to spare for what I can tell you about Judge Craters whereabouts. Nevertheless, as I understand the physics of the thing, the heftier the cable, the better controlled the low end, amps and speakers willing. Maybe I should mention again that the Clairvoyants consist of two hefty 3" ribbons per side. I requested 4 lengths and was surprised by their weight. With the passage of time -- that onerous break-in period -- I was also able to observe something Ive not often heard coming from my system anywhere near as unambiguously, something rather magical. And if you find magic too close to the companys name, Ill settle for delightful. Cables that convey an exemplary mid-to-low fullness are often less than exemplary at transparency and speed. The Clairvoyants handling of transients and their sweet and spacious airiness left me groping for words. Microdynamics were likewise a treat, as were harmonic textures of well-recorded acoustic instruments and voices. Before I wade into particulars: I asked Jerry Ramsey if he prefers his speaker cables to be isolated from the floor. Taking as my cue his less than urgent assent -- "Sure, why not?" -- I positioned a pair of GutWire NotePads under each of the four cables. Sizewise, the black, gel-filled NotePad is the ideal isolator for the wide Clairvoyant. A NotePad, which can support 22 pounds, is primarily intended for placement in combinations under and atop components, though Im not the first to use them as here described. I suspect that the merits of separating a speaker cable from the floor are still controversial. For me, its one of those just-in-case measures. I decided to postpone another relevant tweak, Walker Audios SST contact enhancer, till I was sure I could hear what the Clairvoyants could do on their own. I didnt log my hours with the Clairvoyants, but a whole lot of time passed -- enough for comparisons, starting with the ICs. I was pretty sure that the Clairvoyant ICs and speaker cables are superior performers. However, a relatively recent arrival, that pair of Wilson WATT/Puppy 7s, intruded a note of possible confusion. I had first installed the Clairvoyants in the WATT/Puppy 6es before an unrefusable offer to acquire the 7s presented itself. Consequently, the better part of the Clairvoyants maturation took place via the 7s. The question, then, is: Do I owe my present happiness to the difference between the old and new Wilsons, to the Clairvoyants, or to both? Were the older 6es still on the premises, a comparison remains a comparison. I will or wont hear differences, beginning with different ICs. I replaced the Clairvoyant 4Ds with Nordosts Valhalla ICs, regarded by many as among the best, and then with Nordosts Valkyrja speaker cables, which, when I reviewed them, sounded as good as the top-of-the-line Valhallas. I moved on to combinations: Valhalla ICs and Clairvoyant speaker cables, Clairvoyant ICs and Valkyrja speaker cables, Clairvoyants together, and Nordosts together. It was interesting. I recommend to anyone who can afford it the combination of Nordosts Valhalla ICs and the Clairvoyant speaker cables. Together, they offered a meticulously resolved, beautifully distributed sound. Am I saying that the Valhalla is the better IC? Too close to call. As a practical matter, the peculiarly vertical Mark Levinson mono amps resemble old-fashioned cast-iron radiators, and the IC inputs are at the top. In my setup, the Clairvoyant ICs dangle from amp to player. Their unusual weight puts a considerable strain on the amp-end connectors three protruding pins. Even though the Clairvoyant is locked, absent its XLR outer sleeve, the ICs purchase looks precarious. In general, my good opinions of the cables Ive written about in Ultra Audio stand. But the Clairvoyants ICs and speaker cables are something else. Together, they conveyed a soul-satisfying touch of texture and life that delighted me down to my toes. Is it that they permitted my system in its totality -- basic components, line conditioning, aftermarket power cords, dedicated power lines -- an unimpeded voice? Thats probably close to what was going on. They werent colored in any way, shape, or form. The midrange-to-low-end warmth I earlier remarked settled itself out in time to a full-spectrum display of 24-karat truth. Bear in mind that a system consists of its parts, and that it takes a transparent system to reveal the harmonic textures I hear in a recent and warmly recommended recording of Bibers Harmonia Artificiosa-Ariosa: Diversi Mode Accordata, for violin doubling violin piccolo and viola damore, viola, cello and harpsichord, with Reinhard Goebel and members of Musica Antiqua K�ln [2 CDs, Archiv 474 965-2]. I sat there with my mouth open, mumbling, "Thank you, Apollo. I dont deserve this." Given the right recordings, the fine cables Ive had the privilege of evaluating provided (and provide) thrilling displays of texture. With this beautifully detailed Archiv release, the Clairvoyants jaw-dropper is that hint of something more, that vista seen a tad more clearly: the sense of space, the visualization of each player in his or her place, each instruments harmonic riches. Call it luminosity. Were not discussing rockslides here. Think of a painter applying lines with a brush consisting of a half-dozen sable hairs. Exquisite is one thing; if its long, strong legs youre looking for, try another warmly recommended CD: the So Percussion Ensemble in performances of Evan Ziporyns Melody Competition and David Langs the so-called laws of nature [Cantaloupe CA21022]. The Langs middle movement calls for metal percussion and drums in a top-drawer demonstration of why we bust our chops and bank accounts assembling high-end audio systems. Ive played this track for people who have a difficult time believing their ears. (Its also a nifty way to accelerate your cables coming-of-age, and itll shake the dust off your speakers drivers too.) More remarkable still, the wonderful textures remain in place. Crank up the volume and the recording says "Yes!" (with apologies to Molly Bloom). Ill spare you the litany. Via the Audio Magic Clairvoyant 4Ds, the discs I played displayed their individual characters, from sterling to disreputable, as revealingly as a mere mortal is permitted to ask for. Rather than homogenize, the Clairvoyants (along with everything else in the system) granted the softwares message a free and clear passage. These spectacularly successful cables dont perform magic so much as permit it. Prices: Clairvoyant 4D interconnect, $2200 USD per 1m pair; Clairvoyant 4D speaker cable, $4500 USD per 8 pair.